Toyohara Kunichika (1835-1900) The Actor Ichikawa Danjuro IX as Kamakura Gongoro Kagemasa, 1878. Oban Triptych. 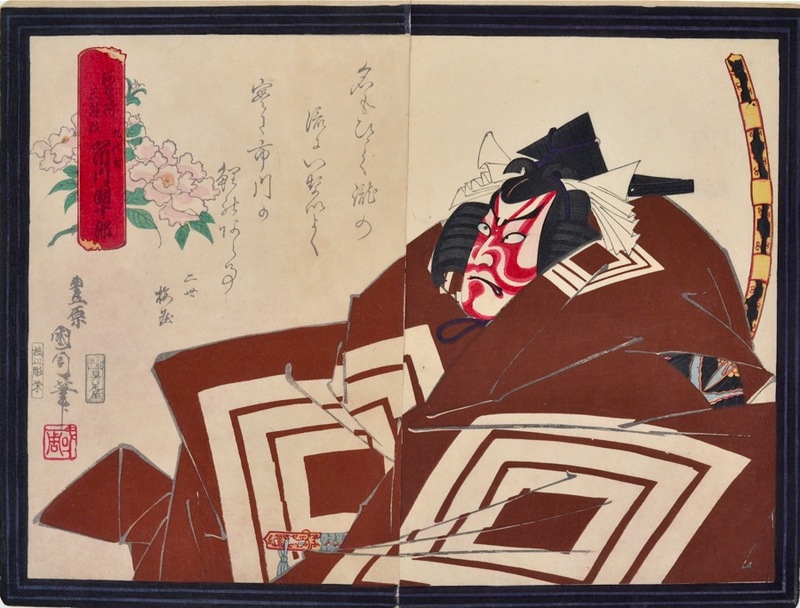 I suggest that this is the great icon of Meiji printmaking… this role and this actor, draped in a vast, stiffened ruby robe, described by canted and concentric rice measures in contrasting white, all of it surmounted by the scowling face of Danjuro the IX striped in the kumadori make up of virtue and honour. So many images by so many artists of this mesmerising theatrical coup... but these portraits (there are several) of the reclining Danjuro in his disordered jumble of broken rectangular devices is perhaps the most persistent. Whether it is the triptych or this remarkable diptych version, the image has become somehow defining of the kabuki theatre as a whole even amongst people unfamiliar with the culture of Japan. The print is from a series commemorating the kabuki 18, Juhachiban no Uchi. The series is part of a masterful public relations exercise by the Danjuro clan to put themselves at the heart of the kabuki world. Danjuro VII commenced this coup-de-theatre in 1832 and by 1840 he had established a canon of eighteen plays that the line of actors excelled in, not because they were fine plays but because they showed the particular ‘bravura’ style of acting which the Danjuros performed. There are several print series which celebrate this set of plays, although Kunichika’s is among the greatest. The print shows the wildly successful Danjuro IX in the costume of Kagemasa; his sword cuts the picture on the right side of the frame, a poem written under the pseudonym ‘Sansho’ is written in cursive script on the left next to a design of peonies associated with the Danjuro clan. The crest of three concentric rice measures not only decorates the robe (subsuming that of the character) but also forms the decorative border that contains the image and the other prints in the series. Kamakura Gongoro Kagemasa was a samurai and warlord of eleventh century Japan, part of the Taira clan and who defected to the Minamoto in the Gosannen war. He is the hero of the play Shibaraku (Wait a minute!) one of the best known roles in kabuki. This is a great print, condition, impression and colour are all fine, full size with decorative border. This print is illustrated on page 98 of Newland, Time Past and Time Present: Images of a Forgotten Master, Hotei Publishing 1999. Signed Kunichika hitsu, seal; Kunichika.